I occasionally hear from my coaching clients that they feel stuck—stuck in their careers, or their lives in general. Sometimes stuck means feeling uninspired. Other times it means they are ready to move on but can’t identify the next step, or they don’t even realize it’s time to plan the next step. Regardless of the what’s causing the stuck feeling, it’s the opposite of feeling jazzed about work. You know your position is a great fit for you when you are excited about going to work, feel energized by the work you do, find that the workday flies by, and are doing work that taps your creativity. When you’re jazzed at work, your productivity tends to soar. We all know that feeling of being on top of the world. When you’re not jazzed at work, your energy level is low, the day drags by, and you’re surrounded by people (maybe bosses) who don’t recognize or tap your potential. Chances are we’ve all been in this position at some point in our lives, too. The idea of pursuing your passion is a great one, but it can feel unrealistic for most people. Our financial, familial, community, and other personal obligations tend to hold us back from leaving an uninspiring position. What can you do if you’re stuck? You can figure out where you want to go, and then you can develop a plan for getting there. Only you can take the responsibility for getting what you want from your career and from your life. Take action and get what you want! The initial step of figuring out where you want to go is much easier said than done. When I decided I wanted to leave corporate America and start working for myself, I used a variation on an exercise shared by Jim Collins, author of Good to Great, Built to Last, and Great by Choice. Since that time, I’ve helped a number of my coaching clients through this exercise. 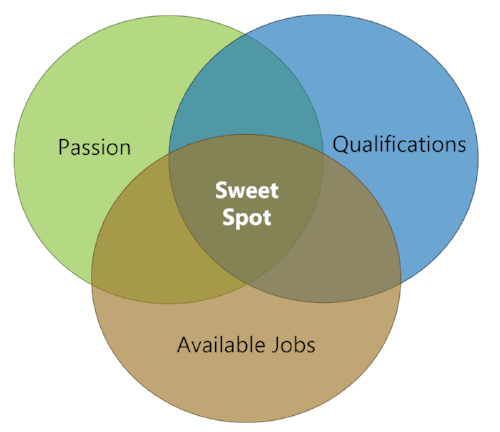 It provides a great structure for identifying your sweet spot. Jim developed it as a variation on his Hedgehog Concept, which helps companies identify what they can (and cannot) do the best. Passion: These are the things that you love to do, the things that jazz you up and generate that feeling of being on top of the world. Passions don’t feel like work because you love to do them so much. Qualifications: List your experience, education, and any other credentials. What does your background qualify you to do? Positions/Jobs available: Do some research. What roles are open? These may be internal positions in your current organization, jobs in the same industry, or other types of roles that you would be qualified for. 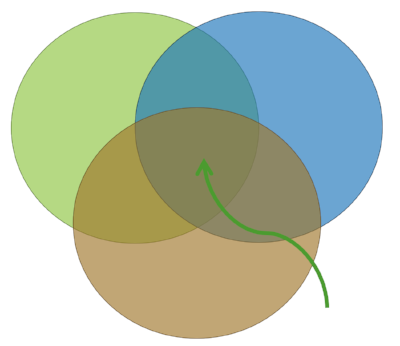 As you fill in each circle, where do they intersect? Where do you want them to intersect? Do you need additional education or experience to land your dream job? Do you need to build your ideal position from scratch? Maybe you need additional exploration to help you determine where your passion lies. Do you have a coach, mentor, or friend who can serve as a sounding board during this exercise? Identifying your sweet spot is a big, positive first step to becoming unstuck. Working toward that change will spark your energy and begin tapping your potential. Please share your thoughts and suggestions!